It may be the midst of summer and the festive season is still some way off but here at Global we’ve been busy working on Christmas projects for our hospitality clients. You may have heard about ‘Christmas in July’ but this year at Global HQ, Christmas concept planning started in February! To find out more about the process that goes into planning for Christmas in the hospitality industry, we spoke to our Client Services Manager, Sam Morley and designer, Dan Gordon. What is it like planning Christmas design concepts so early on in the year? Dan – It’s definitely a unique experience to be thinking about Christmas in February, but as I’m a fan it’s actually pretty fun. We complete Christmas by June and then can look forward to another one in December – all year round festive fun. Dan – One of the biggest challenges is giving the creative as much personality and festive magic as you would in the height of the festive season. Don’t go with anything too gimmicky because your design can be outdated by the time Christmas comes around. 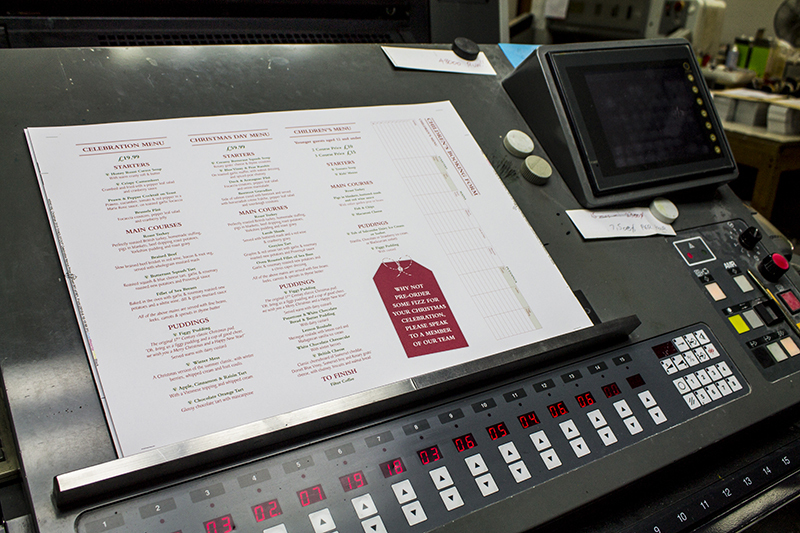 Are there any particular designs that work well for restaurant marketing collateral? Sam – We recommend on keeping it simple and classic let the menus do the selling for you. Santa is always a big favourite. Have you noticed any trends in the designs that restaurants have opted for this year? Dan – Not yet, the Christmas collateral and POS usually starts to appear around August /September if you can believe it. What do you think restaurants can do to make themselves stand out during the holiday season? Sam – Large and eye-catching POS to create a theatrical piece in the pub, think about the customer experience. Christmas is an ideal time to use visuals that are emotive and relatable. LED lights can be used to create a festive atmosphere with minimal effort. If a restaurant doesn’t have their Christmas campaign together in July have they left it too late? Sam – Nope – talk to us, we can help. Any final words of advice on how the hospitality sector can prepare for Christmas? Sam – Look to produce a creative campaign that both reflects your restaurant’s brand as a whole and has spark and standout against your competitors. If you’re planning a Christmas campaign, we can help with all aspects including design, digital and print. Give The Global Group a call to discuss on 01202 727070 or get in touch via our Contact Us Page.